There is a long-standing tradition in Mediterranean and Middle Eastern countries of offering a small gift (bomboniera) to each person or each family who are guests at the receptions given for special occasions such as weddings, baptisms and anniversaries. Tradition holds that confetti are presented to each person (or family) along with a special gift as recognition for their support and good wishes. Five confetti are typically included in the bomboniera to represent wishes for health, wealth, fertility, happiness and longevity. A bigliettino (little tag) is attached with the date of the event along with names (as appropriate). Confetti flowers are very popular as bomboniere. Italian artisans use the confetti candies to construct lovely hand-crafted flowers in many varieties and colors. Or choose a more traditional bomboniera made with some combination of tulle, organza, lace, silk, Italian paper boxes, ribbon and flowers. These can be filled with your choice of any of our varieties of confetti, and decorated with ribbons and flowers. A beautiful bigliettino (favor tag) or imprinted favor ribbon can also be added. You can also add a more significant gift item to complete your bomboniera. 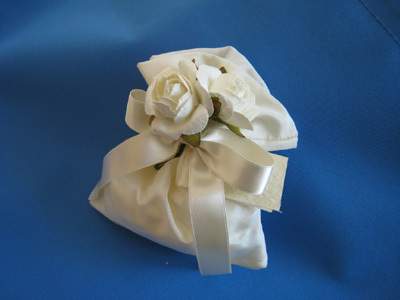 Lovely hand made bomboniere in luxurious fabrics of silk, taffeta and organza from Milan and also Rome. A large variety of gift items in silver or silver plate, Capodimonte and porcelain, crystal and glass (including Murano glass) - all imported exclusively from Europe. Please allow 6-8 weeks for delivery of all custom-ordered bomboniere. Some items in stock for immediate delivery. Don't see exactly what you're looking for? Contact us and we'll search for you until we find it! And check out our Facebook Photo Albums for more Custom-Order choices.